The "SWOT Analysis" solution contains easy-to-use mind map templates that help identify Strengths, Weaknesses, Opportunities, and Threats, as well as outputs to ConceptDraw DIAGRAM for presenting analysis results. 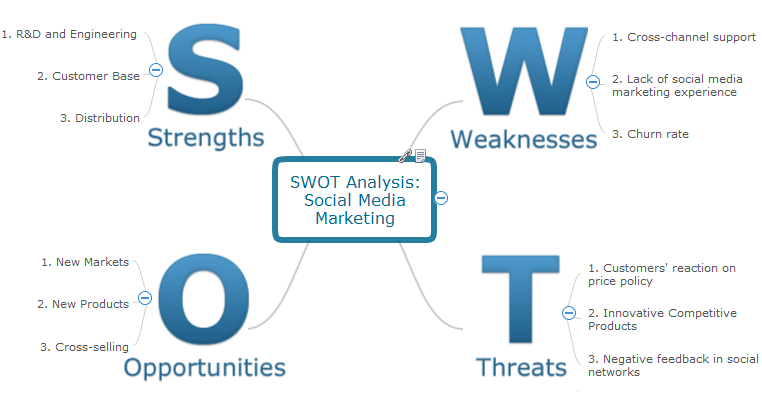 The "SWOT Analysis" solution gives simple visual support for all the steps of a SWOT Analysis process. SWOT analysis is a strategic planning method used to evaluate the Strengths, Weaknesses/Limitations, Opportunities, and Threats facing a project or business. The new template for ConceptDraw MINDMAP isually supports identifying internal and external factors that are favorable and unfavorable. When the analysis is complete, output your data to a SWOT Matrix in ConceptDraw DIAGRAM for rendering to a variety of other formats such as PowerPoint presentation, PDF, image files, etc. 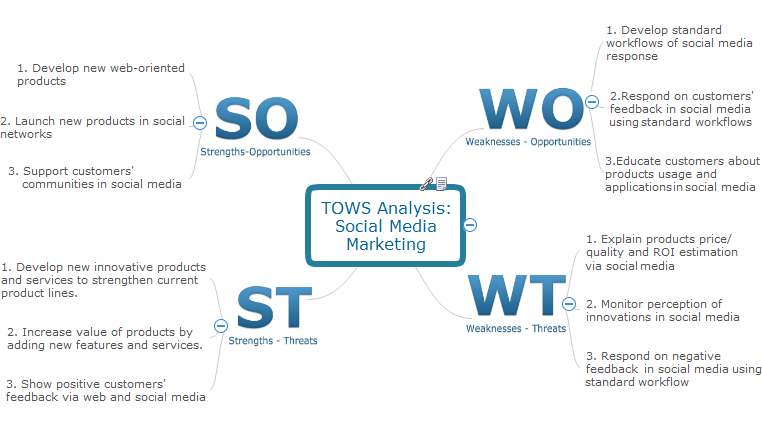 The "SWOT Analysis" solution supports a variation of SWOT analysis called TOWS. TOWS is more focused on external factors and action planning. Use SWOT and TOWS analysis to plan strategic actions for your company, department, team, project, process, marketing campaign, or even self-improvement. Use team meetings, share ideas, brainstorm ideas, team notes with ConceptDraw solution. ConceptDraw MINDMAP v10 is a powerful business and personal productivity software application that provides visual organization and access to information for individuals and organizations.